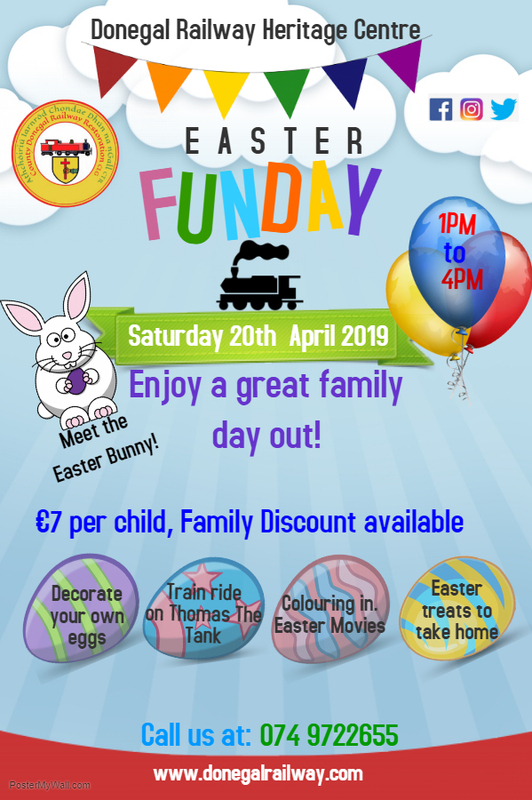 Donegal Railway Heritage Museum is delighted to announce that its famous Easter Funday is back again bigger and better than ever before, on Saturday 20th April, 1pm -4pm. This year’s event for children includes not only a visit to meet the Easter Bunny and an Easter gift (and even a Selfie with the Easter Bunny), but a ride on Thomas the Tank, an Easter movie, Easter art workshops, model railways and much more. This cost is only €7 per child, and family discounts are available. There is no charge for adults, and even better, the Easter Bunny has laid on free tea/coffee and snacks for the adults. As everything is indoor, it’s not weather dependent. No booking is necessary. Donegal Railway Heritage Centre is a registered charity and has been operating for over 25 years. The community museum is an important part of the visitor offer in the town and County, as well as creating employment for local people. Our remit is to keep the history and heritage of the County Donegal Railways alive through the running of the Museum, and the rescuing, restoration and showcasing of unique rolling stock and traction.